Karnella’s rover larvae (Emmelichthys karnellai) were raised from wild-spawned eggs at 77-79F on wild copepods and artemia. The larval duration was 32 days. First record of Karnella’s rover culture. Rovers (Emmelichthyidae) are slender, reddish, small to medium sized, planktivorous, schooling fishes with protrusible, toothless or nearly toothless jaws, long dorsal fins, and forked tail fins with lobes. The family comprises 3 genera and 16 species. Juveniles occur near the surface, often with other schooling fishes, and adults live near the ocean bottom, at depths of 300-1200 feet. Rovers are commercially fished for human consumption, bait and for fish meal but have not been aquacultured. Pelagic juvenile Karnella’s Rover (Emmelichthys karnellai) reared in the laboratory. 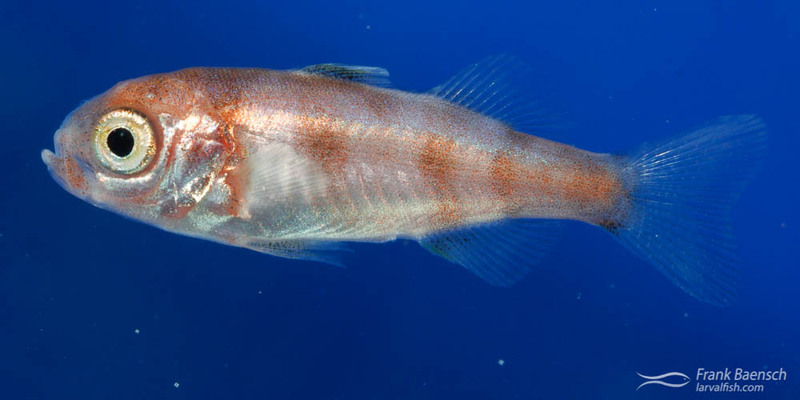 The Karnella’s Rover (Emmelichthys karnellai) is one of three rover species found in Hawaiian waters at depths of 400-900 feet (120-270 m). This species also has been reported from Guam and Easter Island. The largest individuals reach about 12 inches (30 cm). A single E. karnellai juvenile was raised from a batch of eggs collected in coastal waters off Oahu, Hawaii in March, 2013. Rover larvae appear similar to the larvae of some damselfish (Pomacentrid) and jack (Carangid) species in the early larval stages (pre-flexion, flexion) but are less pigmented. This individual was first identified seven days after hatching by it’s relatively large size, calm behavior and unique morphology relative to the other larvae in the rearing tank. It was feeding on copepod nauplii at the surface. Karnella’s Rover (Emmelichthys karnellai) larvae reared in the laboratory. The larva underwent notochord flexion between 15 dph (6.5 mm TL) and 21 dph (8.7 mm TL). The dark bands, characteristic of juvenile rovers, were first observed on 32 dph (16 mm TL). Juvenile growth was rapid, averaging slightly over 2 mm per day. E. karnellai appears easy to culture with a similar growth rate and morphology (but different pigmentation) to the Emmelichthys sp. previously raised for this project in May 2012.